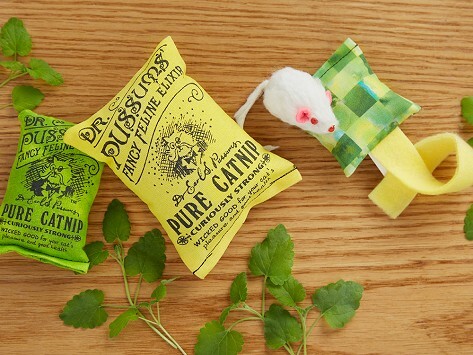 Catnip toys filled with pure, natural catnip are a treat for feline friends. The catnip is sourced from Canada and is known for its potency and purity. The cotton toys are handcrafted in Maine and have a charming, nostalgic finish. A rabbit fur mouse rounds out the playful set of four toys. Dimensions: 8.75" x 3.5" x 1"
Cats played with it immediately, and for hours! My cats started meowing when the package came in the mail and couldn't wait for us to open it. They played and played with the toys and still love them several weeks later. My cats absolutely loved love it! I'm only giving them one piece at a time, sort of rationing the craziness. My cats totally love these toys. Especially the little mouse. Our two cats judged this catnip to be outstanding, as did the cats of two friends we gifted with it. 35 years of making cat toys means Dr. Pussums Cat Company knows what feline friends like. That’s why their toys are filled with pure, natural catnip—and that’s it. There’s no filler added and the way the toys are made is pretty special, too. The catnip is sourced from Canada and is known for its purity and potency. It has the highest percentage of nepetalactone oil, which is the part of the catnip plant that makes cats happy. That best-of-the-best catnip is stuffed into the toys by an at-home work force of retirees and parents in and around Turner, Maine, where Susan Shaw and her family head up the Dr. Pussum’s team. The result of this partnership is playful toys that have a nostalgic, homemade-feeling charm packed with the good stuff cats can’t resist.